Founded by guitarist, lyricist, and producer Luke Machin, Maschine returns with their second effort, Naturalis. It arrives with some personnel changes with new drummer James Stewart and new keyboard player and vocalist Marie-Eve de Gaultier. What hasn't changed is Machin and Maschine's commitment to melodic progressive rock, essentially UK neo-classical prog rock brought forward to the new century. While the past is present, some might hear echoes of contemporary peers like It Bites, The Tangent, possibly even some Muse. Maschine's musical arrangements are complex, but not oppressively so. Time signature and tempos changes are abundant as are the integration of individual musician and instrument development. But the band has a knack for creating hooks of accessibility whether by music or lyrics. You can't escape the dreamy pleasure of Make Believe's synths and vocal arrangements, and then the classy Floydish guitar solos. The song also features Ms de Gaultier's voice: light, pleasing, and emotional. Also, quick to get your attention and draw you in is Hidden In Plain Sight. It features Machin and de Gaultier in vocal duet, yet the composition turns on a masterful blend of pop liveliness and jazz fusion. These are heard through slippery riffs, sweeping bass lines, and smooth groove drumming. Alternatively, a song like Resistance has some assertive riffage in the early half, juxtaposed with a lighter synth middle, then lingering and rising in the end with a fierce guitar solo following. Nearly the opposite, Megacyma has a softer start, before flurries of riffs, bass, and drums rise and swell, at times, returning Machine back to that prog rock jazz fusion. This is quite significant at the nine minute mark with all instruments fully engaged in creating the sound. Overall, Maschine's Naturalis is a fine work of melodic progressive rock, a natural evolution for the band. Recommended. Addendum: The album comes with to bonus tracks, live recordings of Eyes Pt. 2 and Rubidium from 2Days Prog+1 in Veruno. There's not much to say about these. They sound fine and the band sounds cohesive, but there's little heard from the audience. 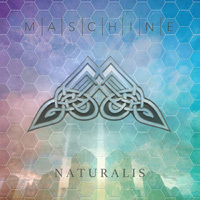 Maschine's Naturalis is a fine work of melodic progressive rock, a natural evolution for the band. Recommended.